We may share your personal details to third-parties for the purposes of providing online and other payment services to you, handling credit checks and fraud prevention in relation to you, and any other services required in order for us to use your information for the purposes of crime prevention or to comply with current law or legislation. We may also share your details with banking or financial institutions where deemed necessary, in relation to trade we carry out with you. Any law enforcement agency, any regulator, any court, any government, any authority or other third party where we deem it necessary to comply with any legal requirement or regulatory obligation upon us or you, or to protect our rights or the rights of any third party where we deem it necessary. By law we must inform your licensing department of any firearms transactions with you, and forward your and our details for processing. Any legal obligation for us to share your information will not automatically give cause for us to give you notice of any sharing, and is not implied. We are committed to protecting any personal information or data collected or retained. Access to personal information we retain about you is restricted to only relevant employees or relevant authorities or relevant third parties, so as to help provide products or services, and to comply with the law. We incorporate technical, organisational, physical, electronic, and procedural safeguards to protect all personal information that you provide to us, against unauthorised or unlawful processing and against accidental loss, damage or destruction. We accept no liability for loss or breach of data due to circumstances beyond our control , for example when your data is in the possession of any authority due to our legal obligations, financial institution, any government law enforcement agency or any third party we deemed it necessary to share your information with, they are then responsible for its security, and we accept no liability once it has left our possession. We may use information we hold on you, to refer to for clarification of facts, communicating with you from time to time, or for the lawful sharing and processing with any authority or law enforcement agency or third party , where we deem it necessary or we are obliged to by law. We may contact you by phone, in writing, by email or electronically or even face to face from time to time in response to your correspondence or enquiries, or may contact you for service or non-sales purposes but shall keep any replies or contact to a minimum unless you request further information , and we will not send you unsolicited sales emails or other unsolicited sales information, we will not request a third party to send you unsolicited sales emails or information, and we will not sell or give your information to any third party for sales purposes. If you require us to remove your email or telephone details we hold, please contact us by email and head it with To the data controller . We shall be happy to remove your details from any reply list, and any other details or information we hold that we are not legally obliged to retain, or any data or information other than deemed necessary to retain in relation to any legal obligation we may have. Current legislation requires that we retain certain details of our transactions with you. Due to this legislation, some information we hold about you, may be retained for a period of 6 years or so, where required to by legislation. Thereafter, and where appropriate, most records are safely destroyed. Some data or information may be retained indefinitely, where it is deemed necessary. Due to firearms legislation, and financial transaction rules, we are obliged to store details of any transaction by way of trade. We shall therefore store all details of your firearms or shotgun certificate, financial transactions, and may also retain emails, written logs, photocopies, electronic data or information, or telephone records pertaining to your transactions with us where deemed necessary, so as satisfy any authority, government, court, law enforcement agency, or to verify facts or for service or warranty reasons. I have shot both rifles last night and the results are excellent. I am very grateful for your after sales service and I can see the difference in the new thread and the re-crown. 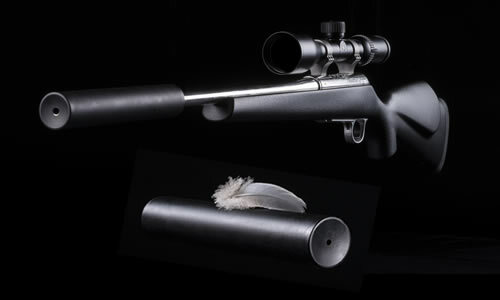 Our Titanium Moderators have proved time and time again to improve both rifle and shooters performance due to reduction of recoil and reduced sound fatigue and all without over weighting the rifle.